Integrated energy solutions provider Zest Energy, a member of the Zest WEG group, is set to hand over a power generation solution for Syrah Resources’ Balama graphite mine, in Mozambique, at the end of April. This flagship project – the company’s largest power plant in terms of power output – involves supplying a continuous power diesel generation plant, with an initial capacity of 12.5 MW. Zest Energy MD Alastair Gerrard tells the media that the mine required a solution that was reliable and continuously available. Seven containerised medium-voltage (MV) power generators, each with an 11 kV generating capacity, were supplied. Further, a complete electrical solution was designed for the plant, whereby the generators were supplied with the electrical synchronisation and control systems, fuel and oil systems were supplied for the generator sets, a cooling system was installed to maintain the most effective operating temperature for the engines and an air filtration and pressurisation system was fitted. Gerrard explains that the availability of the mine’s power supply is ensured by having sufficient standby capacity to allow for maintenance and repairs without affecting the continuous supply of energy. A major challenge during the project was the presence of graphite dust, a highly conductive substance capable of causing excessive damage, should it get into any electrical equipment. “We dedicated a lot of time to ensuring that every electrical component we supplied for this power plant was designed to prohibit any graphite dust ingress,” Gerrard emphasises. He adds that the air filtration and pressurisation system supplied for use with the generators is highly specialised to mitigate this issue – it removes graphite dust from the air and prevents the cooling air that is pushed through the generator sets from being contaminated, thereby preventing equipment damage. At 185 m long and 54 m wide, the power plant has the largest footprint design developed by Zest Energy. It is based in a remote location, which Gerrard says makes it difficult to access, a situation prevalent on many projects undertaken by the company in Africa. Therefore, the company focused on designing the plant for ease of maintenance, including long-term operational requirements in the design. In line with Zest Energy’s supporting group services and products, most of the equipment for this project was sourced from within the group. Meanwhile, Zest Energy also successfully implemented a project at the Kamoa-Kakula mine project, in the Democratic Republic of Congo (DRC). The mine is a joint venture between Canadian mining company Ivanhoe Mines, China’s Zijin Mining Group and the DRC government has been independently verified as the largest copper find in Africa. The project handover in October last year marked Zest Energy’s first successful mobile substation solution delivered to the DRC. The high cost of powering a mine using diesel generators resulted in the decision to procure a mobile substation that could interface with the network of the DRC’s national power utility Société Nationale d’Électricité (SNEL) and supply power to the mining operation during its construction phase. 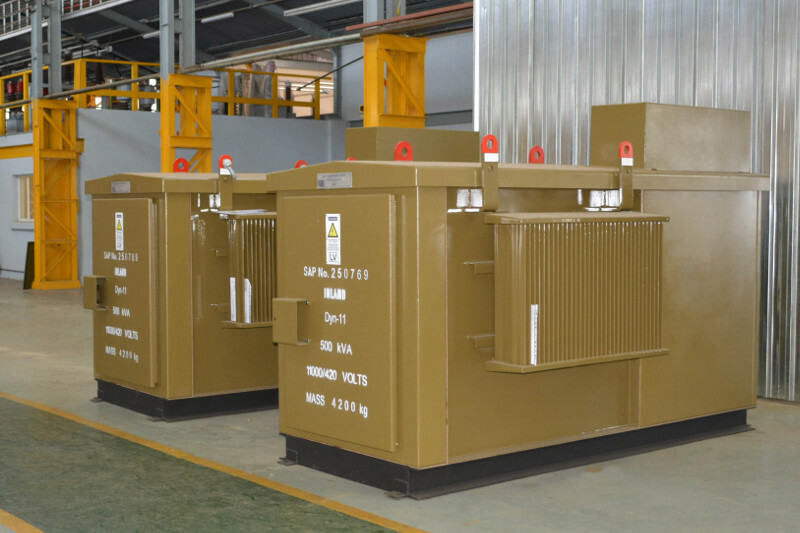 The company supplied a complete 120/11 kV mobile substation, incorporating a 15/18 MVA custom-engineered mobile transformer. Zest Energy undertook the full scope of the project – designing, manufacturing, supplying, testing, delivering, installing and commissioning the complete mobile substation – inclusive of the trailer, transformer and related electrical equipment, expounds Gerrard. He notes that much effort went into the trailer design – the overall dimensions and weight – to keep it within road limitations and road ordinance requirements when transporting the mobile substation from Johannesburg to the DRC. However, challenges were experienced in keeping the mobile substation within these limitations and requirements. These challenges were mitigated by disassembling the transformer, transporting the auxiliary components to site by road and reassembling it on location, requiring oil filtration and purification, and a full spectrum of tests to be conducted after reassembly. Moreover, a complete substation protection system together with an earthing system was supplied, all which complied with SNEL requirements, says Gerrard. Energy solutions for Africa should be predicated on an in-depth understanding of a country’s requirements, its available resources and the technologies that can offer the most cost- effective solution with an acceptable return on investment, posits Gerrard. This principle guides Zest Energy in providing integrated energy solutions specifically tailored to suit clients’ requirements across Africa. Gerrard points to definite shortages in and availability of energy at cost-effective prices as inhibiting mining project development on the continent, which Zest Energy aims to counteract by perceiving energy in Africa as a commodity. The twenty-third World Energy Congress held last year revealed that half of the world’s capital is invested in energy and this ever-increasing worldwide demand is driving the market to consider the different energy sources and technologies. It is essential that Africa be supplied with an integrated energy system, emphasises Gerrard, highlighting that the continent has an abundance of various fuels, such as biomass and coal, and potential renewable-energy sources for the generation of hydropower, wind or solar power, but the majority, or two-thirds, of its population does not have access to electricity. Gerrard explains that just the construction of power plants to redress this electricity supply deficit is insufficient, suggesting that this requires a comprehensive understanding of how electricity from a fuel and/or energy source can be delivered to where it is needed. This conundrum is exacerbated by Africa’s lack of or inferior supporting electrical infrastructure for the transmission of electricity, he says, noting that the source of electricity generation can often be far from the projects or towns for which it is destined. Gerrard indicates that much of this ageing infrastructure is poorly maintained, with weak cross-border connectivity coalescing to result in an inherently unreliable network. This erratic power supply, coupled with “the political and financial constraints that are well known to the market”, often hinders the development of mining projects. To mitigate this unsecure power supply, Zest Energy focuses on designing, developing and constructing a complete integrated energy system that includes power generation systems and supporting electrical infrastructure, leveraging its proven record and experience in supplying solutions for Africa. Gerrard explains that enabling the development of cost-effective and reliable solutions is integral to African governments attracting more investment in their energy markets, as it provides references for the support of development and showcases the potential return on investment. “We have a huge amount of experience on the African continent and believe we can facilitate this growth,” he extols, adding that Zest Energy offers a complete energy solution, which is necessary in most African countries. Zest Energy, being a subsidiary of Zest WEG Group and its parent company, manufacturer of electrical products WEG, in Brazil, capitalises on access to a huge international spectrum of products, skills and services. Gerrard says with this international support and expertise, Zest Energy can take advantage of groupwide technological developments and tailor them to meet Africa’s needs.